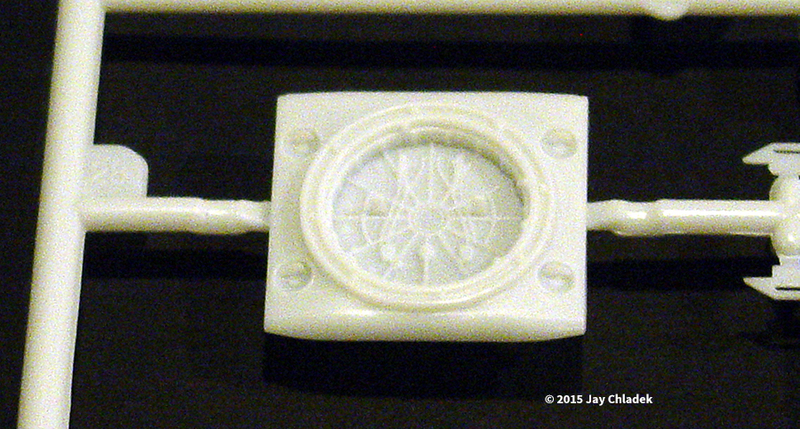 Parts: 41 - molded in light gray plastic. Instructions: Fold-out assembly diagrams/ English text in 5 steps, plus painting guide in black and white. Detail: 8 - The detail we get looks good, but is simplified in places. Overall Rating: 9 - a nicely done kit of a cool design. When I saw "Interstellar" in theaters late last year, I was impressed by the visuals in the film. Sure, the story may have had some issues, but overall it was what I considered good entertainment. One particular element that caught my interest was the Ranger, a small ship that was designed to scout alien planets from the main ship, the Endurance, and return with its findings. The vehicle's design was a feast for the eyes at it looked like a cross between a NASA space shuttle, an Air Force lifting body and Burt Rutan's SpaceShipOne. 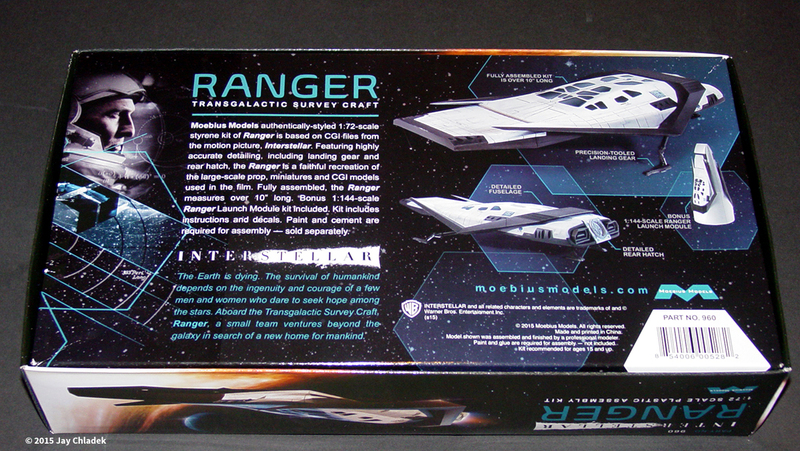 Moebius Models announced that they were doing a licensed kit of the Ranger around the time the film came out and we waited with eager anticipation for it. But how big would this kit be and how would it stack up? Thanks to a couple favors, I was able to obtain an example of this model. Just to be clear, this is NOT a test shot. It is a full production sample of the kit. At last check, the first shipment of kits is set to arrive at distributors in July if all goes well. They are coming via slow boat FROM China. So what can be expected when the kit arrives? 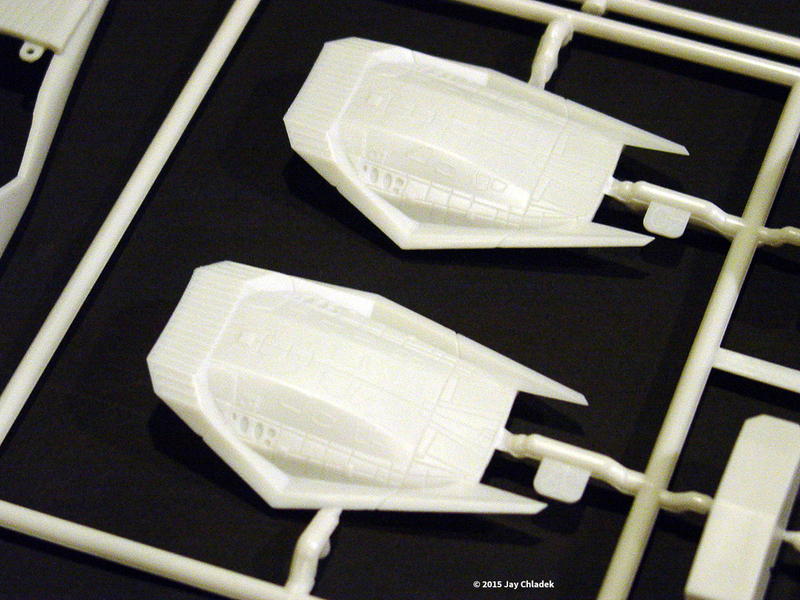 The kit comes packaged in a box similar in size to what we've become used to with other Moebius offerings, such as the 1/32 BSG Vipers. 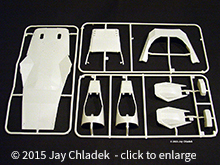 The parts come in two plastic bags and a small decal sheet is also provided. 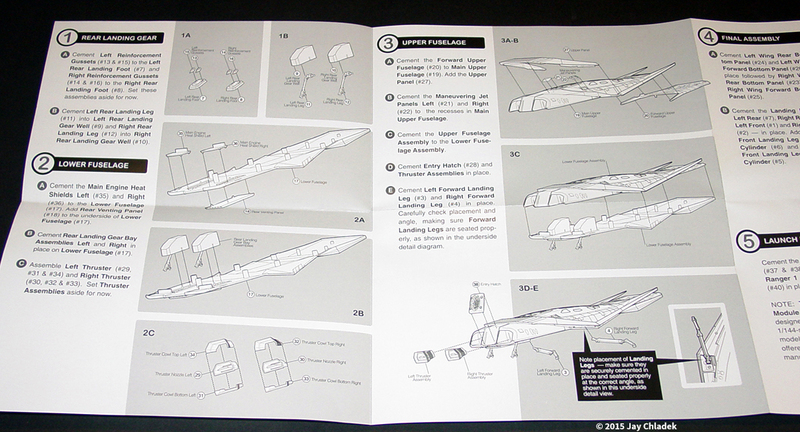 An instruction pamphlet is provided focusing on five major assembly steps and a paint/decal guide with black and white pictures of the completed model. 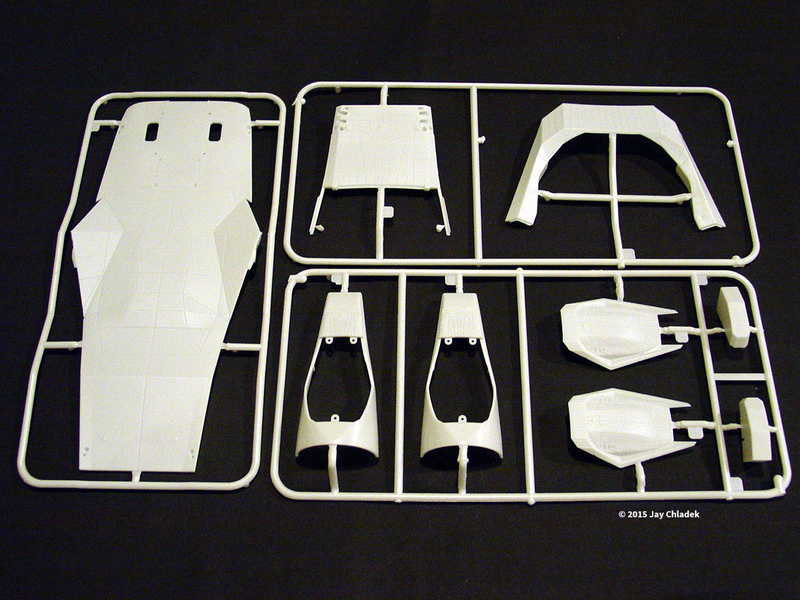 The parts are molded in an off white plastic with a slight matte sheen to the parts. The majority of the parts make up the 1/72 Ranger. 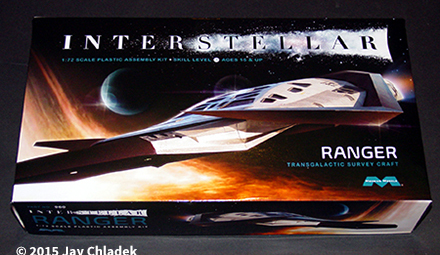 According to the information provided, the kit was designed from the original special effects CGI files. CGI elements were used for only a fraction of the effects shots as most of the work was done with models. But since the practical models also made use of 3D printed parts, it makes sense that the CGI files were also done from the same resources. From looking at the Interstellar article featured in issue 140 of Cinefex magazine and repeated viewings of the Blu-Ray, it looks as though Moebius has captured the appearance of this model rather nicely. 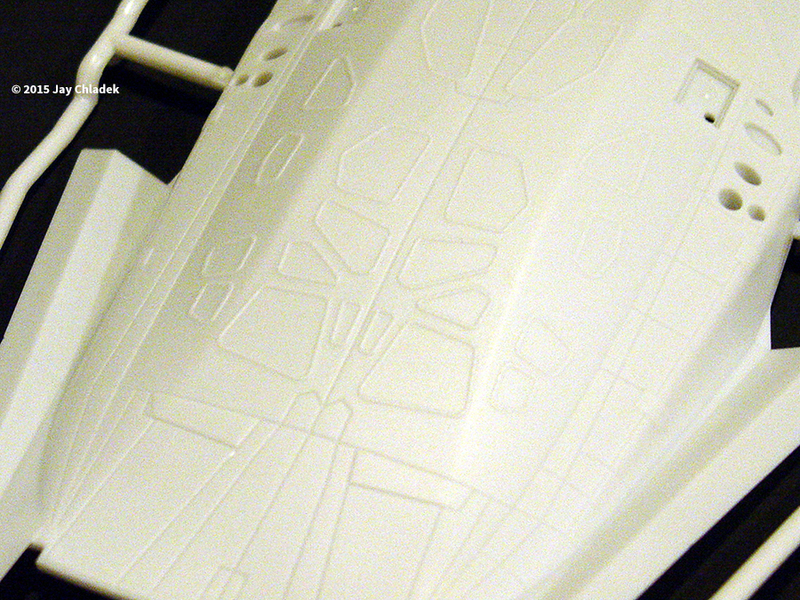 The panel lines between the thermal protection tiles look a little big compared to a space shuttle, but the appearance seems right as the artists were creating a model for a film, not something that would fly in real life. 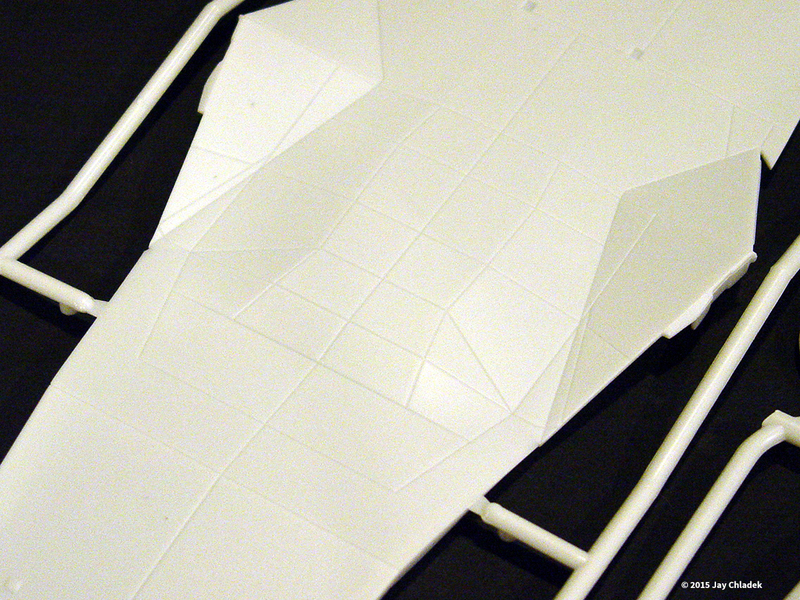 A layer of primer should reduce the panel line appearance well enough. Detailing of the small bits, such as the EVA handles and docking hatch looks good, even if we aren't quite talking Hasegawa/Tamiya detail fidelity. Doing some proper detail painting and adding a wash should make these features pop out rather nicely. There has been some debate about the window frames being raised when they appear to be flush to the hull in the film with the windows themselves slightly sunk in. To me, the window appearance looks fine and I know some painting techniques that can improve their appearance. Four landing struts are provided to display the Ranger in a landed configuration. No display stand is provided, although it would be pretty easy to make one. Four pieces in the kit make up the Ranger launch shroud. They are designed to fit on a 1/144 Saturn V model kit. The launch shroud was only briefly pictured and it looks right, although it was never made clear whether the Saturn lofted one Ranger or a pair. In the shooting script and the novelization of the film, it was implied that the Saturn launched two Rangers while the film implied only one was flown. The exposed detailing of the launch shroud Rangers looks good, but no bottom detailing is provided. So if you plan to model a full Ranger in 1/144 scale, expect to do some scratch building. Now one aspect of the kit that may turn some people off is the 1/72 Ranger lacks an interior and the windows are molded into the body and not separately. Given the price point of the kit, I can respect that decision. The interior of the Ranger as shown in the film was rather complex and featured seats and control consoles that could pivot 90 degrees. Adding such detailing would have pushed the price of the kit skywards. Plus, with the relatively small size of the windows (even though there are a lot of them), it would have been difficult to make out the interior details, unless internal lights were added. Rest assured though, I have no doubts that somebody will offer a cockpit set for this kit eventually, be it resin, 3D printed or both. The three Rangers seen in the film all had essentially identical paintjobs. The instructions list black and white as the primary colors, although this could be spiced up a bit with various off-white shades, black and dark gray shades, plus some metallics in spots. 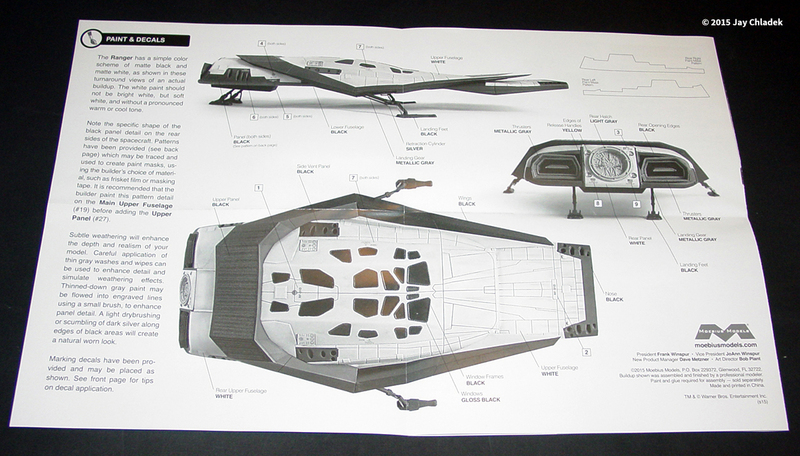 The Ranger's appearance was heavily derived from the space shuttle as the film's director, Christopher Nolan, got a lot of inspiration for the look of the craft from Space Shuttle Endeavour, which went on display at the California Science Center shortly before the film began production. Shuttles Endeavour, Atlantis and Discovery themselves can provide loads of inspiration and reference for how a modeler might want to detail and weather the Ranger as there are a lot of little "Easter eggs" in the studio model finish. In fact I have been toying with adding some cloth tape in spots to my model as it appears, like the shuttle, that the Ranger also makes use of advanced thermal insulation blankets on portions of the upper hull. One small decal sheet is provided and it contains the majority of the stenciling and identification markings found on the Ranger itself. They are full color and look good, even if they are on the tiny side. Both Rangers 1 and 2 from the Endurance were apparently marked up exactly the same. I suppose if one wanted to, they could perhaps do up a Ranger in test markings, saying it was the one Cooper crashed in the flashback sequence at the beginning of the film. Since we only ever saw that particular Ranger from the top, nobody can say it is wrong. I have started work on my Ranger. Anyone who has built other Moebius kits will be familiar with how things fit. For newcomers, in some areas, parts practically snap together. Be aware of that during test fittings. Otherwise, you might have a problem getting an assembly apart after test fitting it (such as the main body). One aspect of the kit design that I like is they did a very good job at hiding several of the join seams. Some filler will be needed in spots, but it doesn't appear to be a major issue. 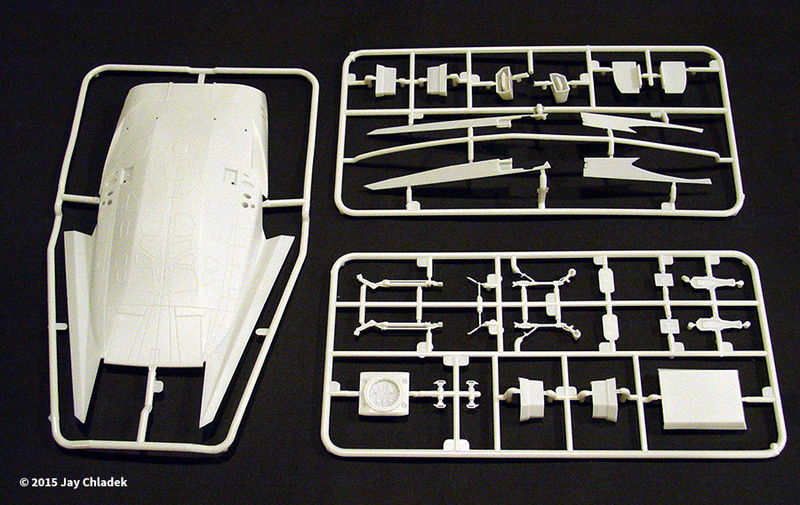 The kit is designed to be built with the landing gear struts extended. It should be possible to build it gear up, although as with any other kit designed for gear down, it may require some parts modifications to get things to fit. As for building the model gear down, while I haven't gotten to that step yet I understand the alignment of the main gear struts can be a bit tricky. So make sure to test fit frequently and consult reference photos whenever possible. The instructions don't make clear what the gear bay colors are. In my case, I am going with metallic shades since the space shuttle went that route to help reflect heat buildup during reentry. Granted the gear bays are small on the Ranger and likely won't be seen easily, so pretty much any color would work. Overall, I like what I see. It remains to be seen how Interstellar will be remembered in the history of science fiction films, but it is very refreshing to see Moebius take a bold step and give us a kit of the Ranger in a decent size. One thing I love about the kit is it looks equally at home on display with science fiction vehicles as it does with real space hardware. The launch shroud Rangers should also look great perched on top of a Saturn V model, although it will be up to the decal aftermarket to provide markings for a rocket only briefly glimpsed in some of the effects shots. 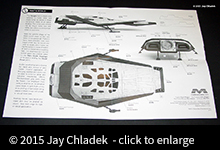 Paragrafix will be issuing a photo-etch set for the kit which adds details to the VTOL landing jets, the fueling ports and the rear hatch. As I see it though, even if this kit is built straight out of the box, it should result in a great looking model. So if you are looking for something a little different to add to your model collection, the Ranger should do the job nicely. Many thanks to Moebius Models for providing the review samples. Manufacturers and retailers, interested in getting your wares reviewed and publicized on a site averaging 6000+ readers a day? Contact us! This page copyright © 2015 Starship Modeler. First posted on 26 June 2015.